Originally released earlier this year as a mobile game, turn-based strategy game Warhammer 40k: Deathwatch has been remastered for a PC release, and will drop-pod onto Steam on October 20 this year. The enhanced edition sports redesigned UI, customisable mouse and keyboard controls, and "dynamic lighting and special effects" courtesy of Unreal Engine 4. As the Deathwatch, your fireteam must travel to broken cities and broken spaceships to punish hordes of rabid Tyranids. If you've played the team's Warhammer fantasy effort, Warhammer Quest, you'll have a feel for the moreish beat dungeon -> loot -> level up reward loop. Expect lots of equippable weapons, war gear, and characters from a wide range of Space Marine chapters. 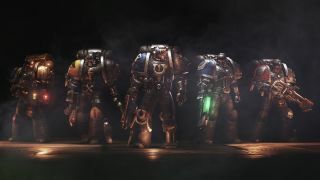 The PC version includes new soldiers from the Imperial Fists, Black Templar and, the the most Byronic chapter of all, the Dark Angels. There are no pricing details yet. The mobile version sold for £3.99 / $4.99 on the app store.